Over a year ago, my aunt brought me a beloved cardigan that had been darned a few too many times to keep wearing. She asked me if I might want the yarn. You all know how my stash of yarn has been overflowing in recent years and I’ve been trying to decrease its size, not increase it. 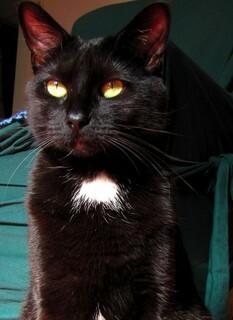 But in this case, for this yarn that I knew I’d figure out how to give right back to her, I could make an exception. It was fiddly to work with because it consisted of two unplyed stands: a tan/silver thicker cotton/acrylic one and a thread in either blue, orange, or brown. I managed to keep it all together while unraveling and then again when crocheting it. I like the pattern a lot. Initially skeptical of doing the last round of picot stitches for the edging, I’m glad I did. They add an essential dimension to the piece and pull it all together. I hope she likes her “new” shawl! We’re moving in about 6 weeks, so I’m packing and sorting through everything. Making some difficult decisions about things that, while I might have strong feelings about, maybe haven’t seen the outside of a box/closet since we moved in here 3 years ago. I haven’t crocheted any clothing for myself in ages, probably because the pieces I already have aren’t things I love all that much. The shrug below has already been unraveled. The yarn, which I like, will be better in something else. The next two have both been bagged up and boxed away, even if they’re not perfect. This red little thing is the first piece of lace I ever attempted. The yarn, Caron Simply Soft, is not holding up well even through I’ve barely worn it, but feeling gas won out over function for now. This cream top still has potential, although I need to figure out how to stop it from sliding off my shoulders. This last piece is sitting on my desk note as I write, making me go back and forth on my decision about its fate. I think I want to unravel it? 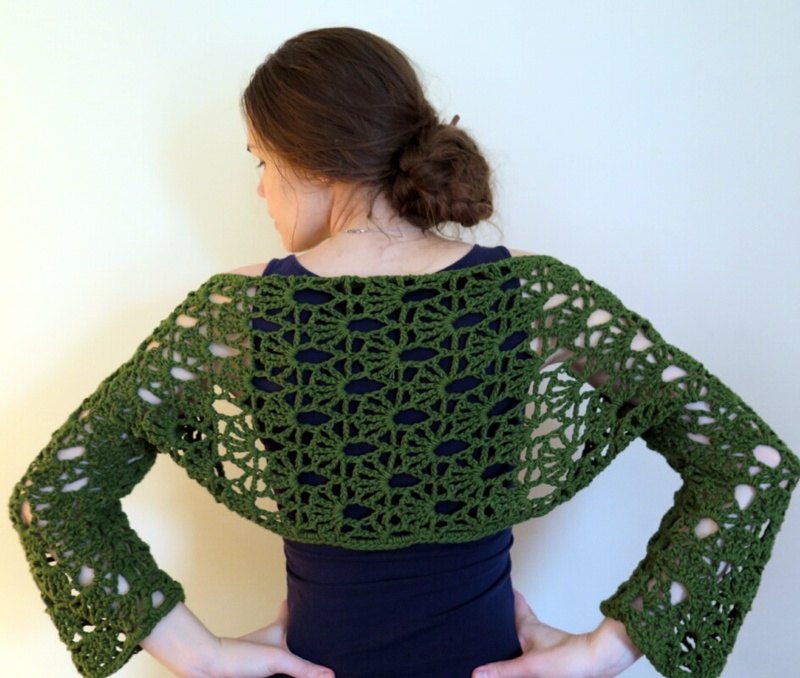 It was a pain to make (read my Ravelry process notes here) and I’ve only ever worn it once. 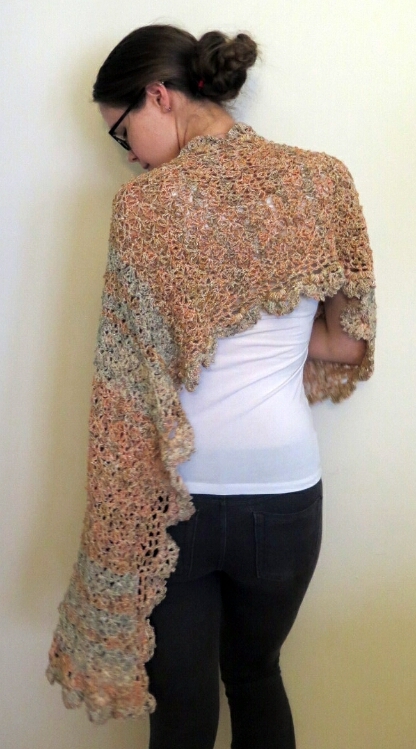 Crocheted dense summer wear doesn’t make much sense… but something is making me hesitate and I don’t quite know what. What do you think? Keep, toss, or unravel? New life for old yarn – Oh, the possibilities! Sigh. Being on the job market, trying to finish my dissertation, and slowly recovering from an RSI have wreaked havoc on my crochet productivity over the past few months. I made a few small things that I hope to get caught up on here. I crocheted only one (1!) 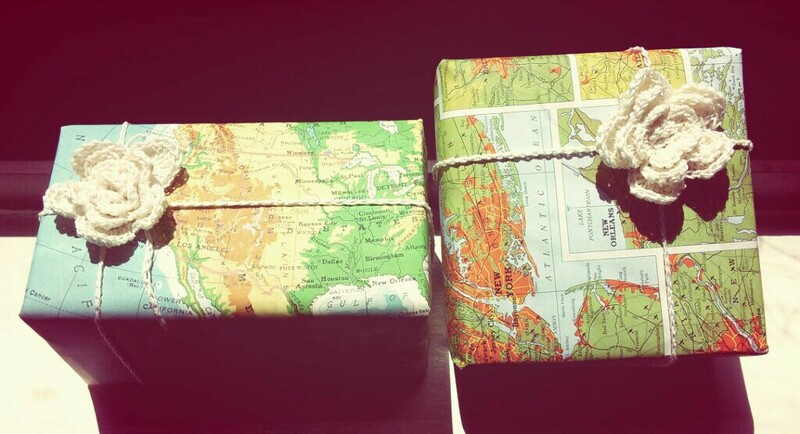 Christmas present. 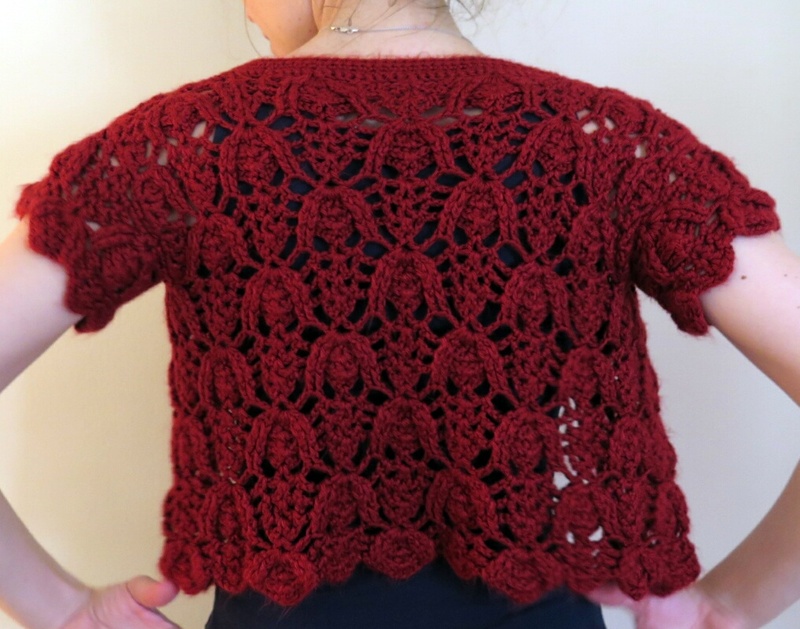 I have made no progress on my two long hibernating big projects – the lace weight red cardigan and the giant granny blanket. Here’s what I’ve been thinking about recently, however. 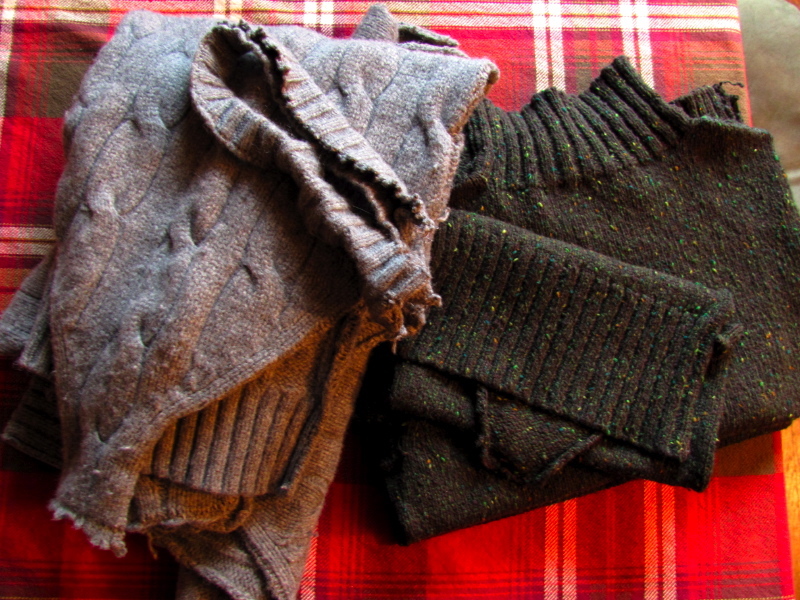 Below, on the left, is a grey 70% wool / 20% nylon / 10% cashmere sweater that I bought almost 5 years ago, right when I started getting into unraveling sweaters and working with recycled yarn, a little before I started this blog. I weighed the remaining two balls and found I have 110g left. What to make next? Should I be all matchy-matchy and make myself some mittens or fingerless gloves with the remainder? I’d probably still have yarn left after that. It strikes me an entire winter set in this grey might seem a little silly though, especially if worn all together. It’s been so long since I’ve blogged about crafting that I actually had to go back and read my old posts to see where I left off! In the past month, I finished (ok, so I still have ends to sew in) the secret project, made two more mug cozies, and made another Geoui scarf. I also started another secret project and a cotton basket. More on all of these soon. I’ve been taking things slow, not just because it’s been a bit warmer, but also because my wrists have started aching a bit. I don’t actually think it’s from crochet, but crochet aggravates the pain caused by too much typing on my computer and awkwardly holding my tablet when I read in bed. I’m confident that through stretching, resting, and icing when it gets bad (which I haven’t had to do in about a week!) that I’ll be fine, but it’s annoying too. There’s so much I want to be working on! Let me start with the Geoui Scarf. Why another one? Back in March, I attempted this pattern for the first time with what turned out to be far too little yarn. Fortunately, Gene’s mother being the fashion icon that she is, actually loved the little teardrop cowl and adopted it for me. present for my mom this past Mother’s Day. I loved how it turned out. When I hit a lull in my works in progress, not wanting to cart around the secret project or get back to my long-neglected hoodie, I started yet another Geoui. In March, Ravelry user/designer Manfredovna sent me a massive amount of worsted weight acrylic yarn for my granny square blanket, accepting no payment in return. I’d always intended to make her a scarf or a shawl to say thank you, but it took me months to get around to actually making it. All the more surprise when it arrived in her mailbox, I guess? This time I used some 70% lambswool, 20% angora, 10% nylon yarn that I’d unraveled from a sweater years and years ago. It’s a heavier weight than the lace thread I used for my mom’s scarf. I also went up from a G hook to an H hook. I like the finished product so much I think I’m going to have to make myself one someday. Yes, ANOTHER Geoui. Yulianknits, could you have imagined I’d fall so in love with this pattern when you gave it to me? 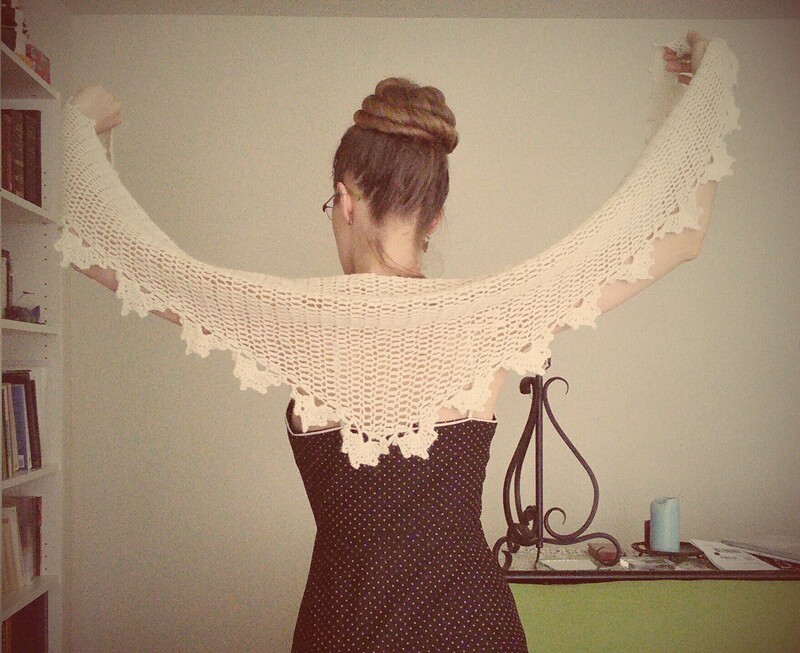 Oh, and when Manfredovna received her scarf, she sent me a copy of her newest pattern. Her generosity overflows! The pattern is for a cotton market bag, called Nonstop Net. I’m excited to try it out when I get the chance! After making Sara that bikini top and buying her some lacy undies for her bachelorette party gift, I realized last minute that I had no wrapping paper or bows. No matter. I taped together pages from an old-ish atlas I got for free after a used book sale and crocheted rosettes to substitute for bows. 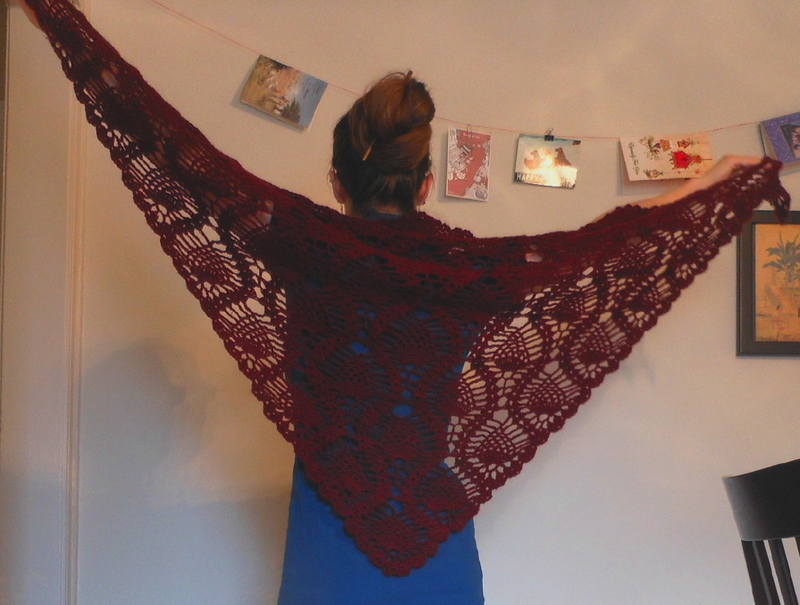 By late November, everything about this shawl was done except for blocking. Knowing that it would be huge and I didn’t want to block it on our bed, I waited until we had the excuse to unfold one of our futons. I finally had that excuse on Monday. When my brother stays overnight, he insists it’s not worth the fuss. But when his girlfriend stayed over with us, I wasn’t about to make her sleep on a folded up couch. 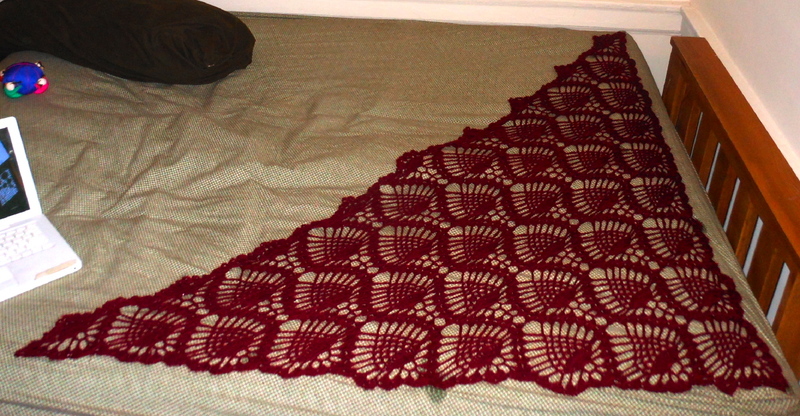 Besides, as I said, I’d been waiting for this opportunity to finish the shawl. As I predicted, it’s huge. Thankfully, it’s not too long down the back. The length along the sides makes it easy to tie or pin in front, and gives a lot of coverage over the arms. I’m really happy with it, and I hope Gene’s grandmother will like it too! 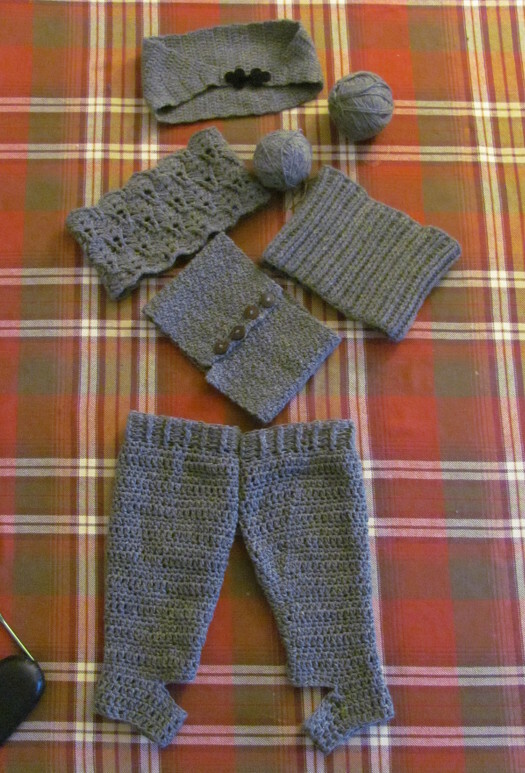 FO: Winter set for me! Gene and I will be visiting his extended family in China in early January, thanks to his parents’ generosity. 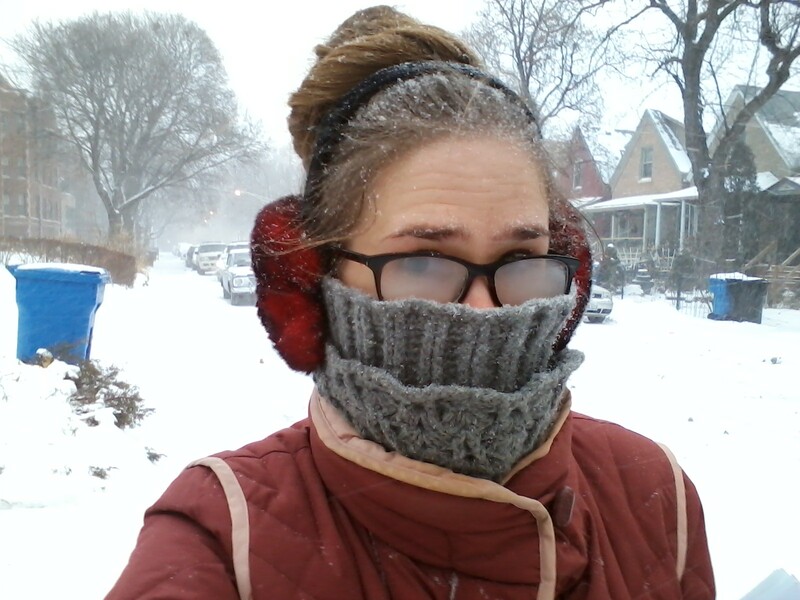 Looking to make a good impression, I realized that my winter accessories, made haphazardly over the years, don’t match each other at all. 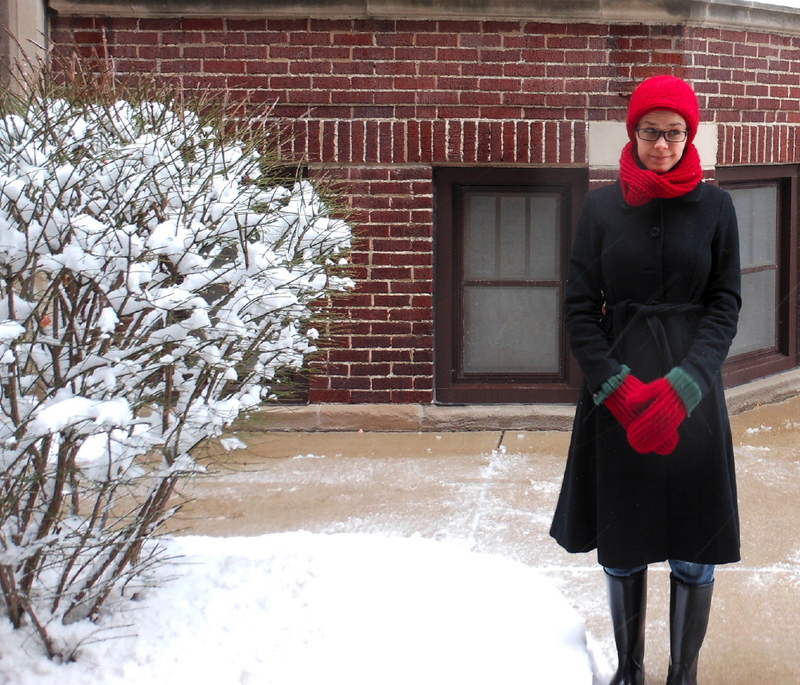 So, in the name of consistency, I now have a winter accessory set. This red wool has made a few appearances on this blog over the years. It was featured in my yarn winding & washing post. A little bit of it went into these baby gifts. I earmarked it for a hood that didn’t quite work out (part 1, part 2). Aside from the yarn itself, the pieces are united by dependence on front post double crochet and back post double crochet stitches. Using these stitches results in thicker, stretchier fabric that also looks somewhat like knitting. I really like wearing all these together. I think they add a much needed brightness to the dreariness of December. 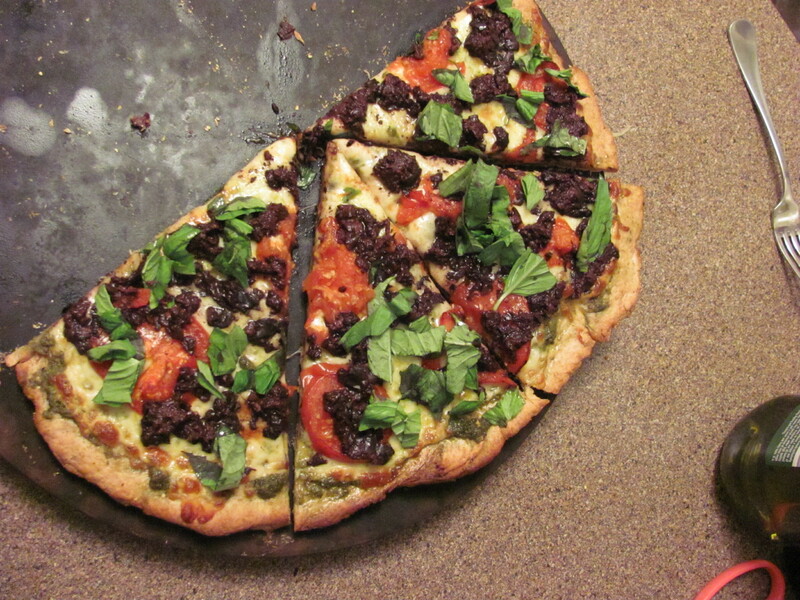 Gene has making thin crust pizzas, using flour tortillas as a crust, down to a tasty art and a science. When we’re more in the mood for a thick crust, I’m invited into the kitchen to collaborate with him. I make and roll out the dough. He then layers all kinds of toppings together and pops the preheated pizza stone back into a 475˚F oven for roughly fifteen minutes. Fantastic. I’m not sure why it’s never happened before this last pizza-making evening, but the enameled trivet started to melt itself onto the bottom of the very hot stone. It came off with a light tug, but presented a real problem to future uses of the stone. That is, until I solved the problem with crochet! Just earlier that afternoon, I’d been wondering what to do with two smallish balls of lavender wool that I do not prefer. Wool ignites at 600˚C, far far hotter than the temperature the stone reaches in the oven. 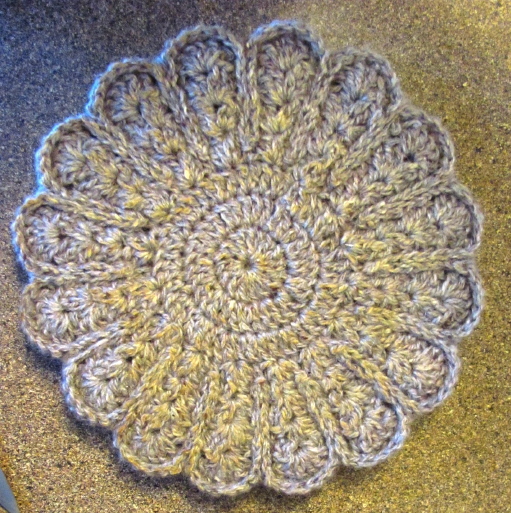 In short order, I made a flower potholder, following this pattern, and now our trivets are safe again! Yes, it singes, but it won’t burn and should singe less as the stray strands of wool burn off and the potholder felts. 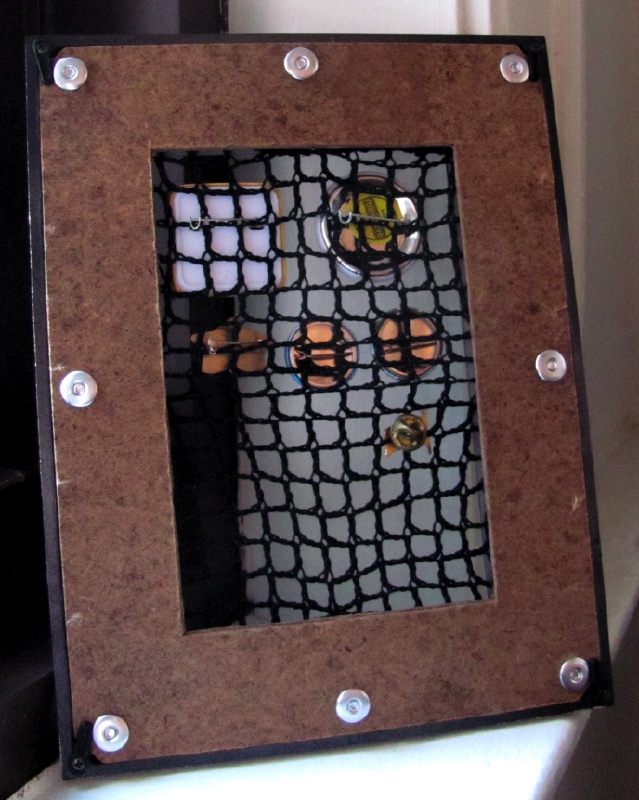 The following day, I made a quick open mesh rectangle because Gene figured out what he wanted to do with all these button pins we somehow acquired and found again while unpacking. 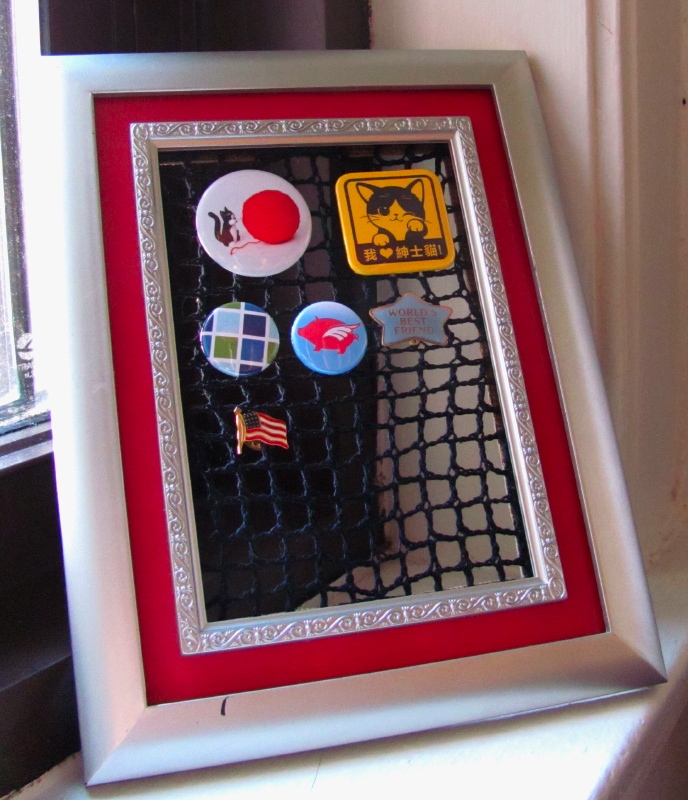 Based on the idea of my earring holders, he took a thrifted picture frame, cut out a hole in it, and used some serious hardware to tack my mesh across the opening. 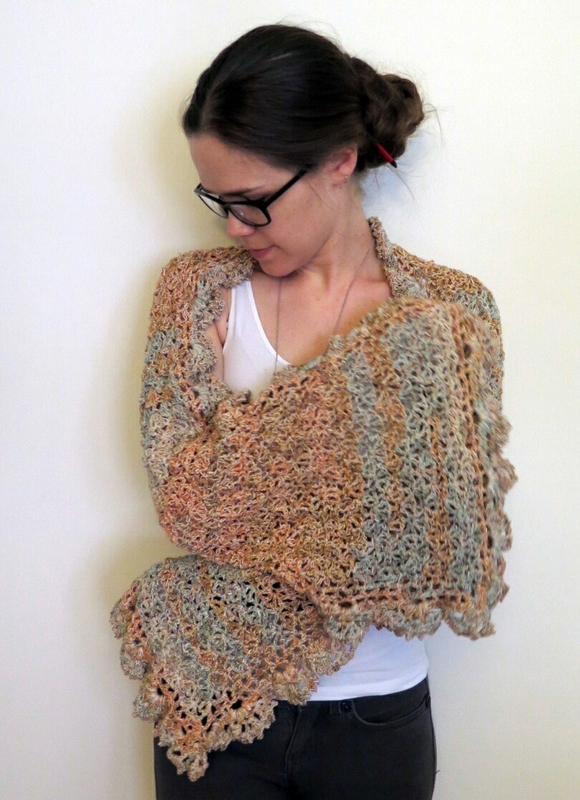 Crochet isn’t just for making winter scarves/hats/mittens and cute dinosaurs! 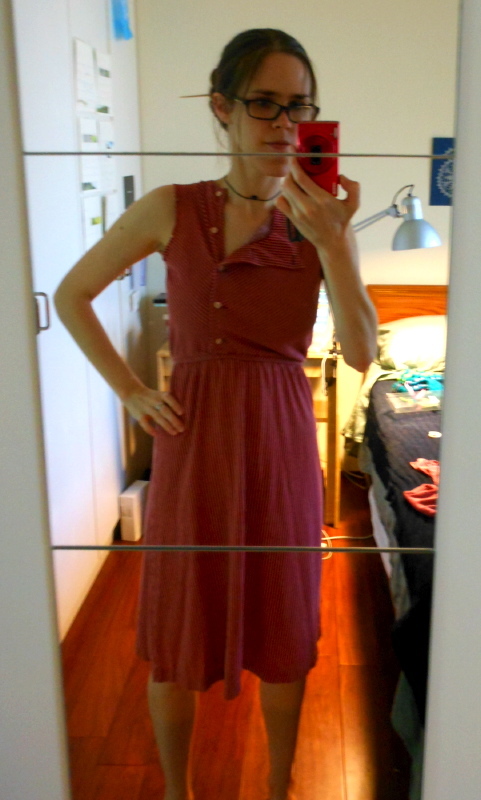 I got this dress at a rummage sale last May for $3. 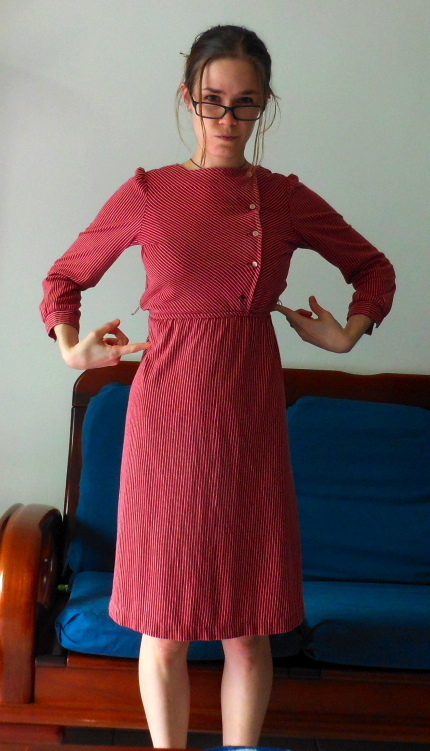 I bought it because I liked how weird it was, with its asymmetric blouse and stripes on the diagonal, but some other quirks prevented me from wearing it very often. For one, the tight elastic waist sat about two inches above my actual waist. Then there was the puffiness of the too-short sleeves to object to, along with the strings at the waist meant to attach a long lost belt. It was also missing a button on one cuff and the stitching was ripping out under the arms. Yes, I brought this weird dress with me when we moved, even though I’ve worn it maybe twice in all of the ten months we’ve been here. Protip: Don’t pack your clothing for a year away while exhausted and frazzled. I’ve no idea why I thought this dress, in its original state, was worth the luggage space. After giving the poor thing its second chance two weeks ago, I decided more drastic measures were necessary to bring it into greater rotation with the rest of my wardrobe. Off came the sleeves, which was a start towards making this wearable. 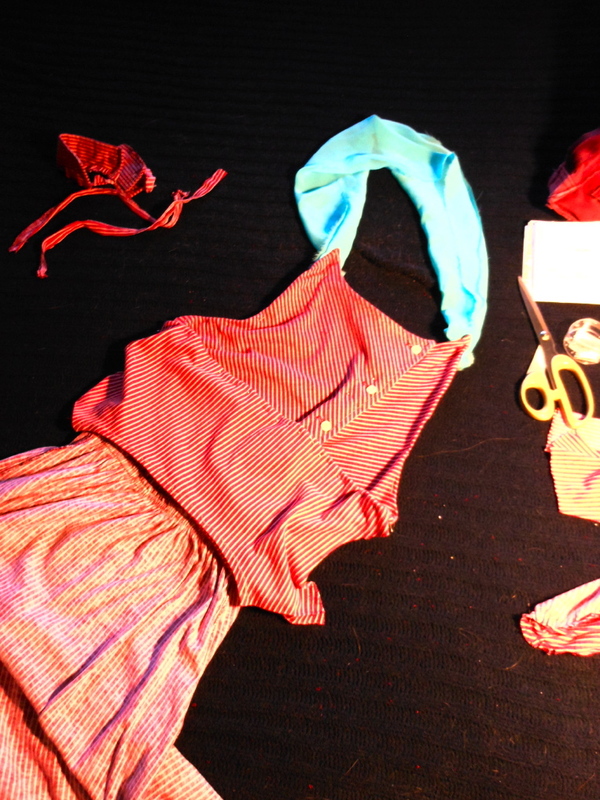 Then I cut across the shoulders and folded down the back half and gave the raw edges on the front a new hem. Using a piece of scrap fabric as a temporary halter tie, I tried the dress on, made some darts in the new back, and sewed! By the way, since my sewing machine is in America, this was all done by hand. 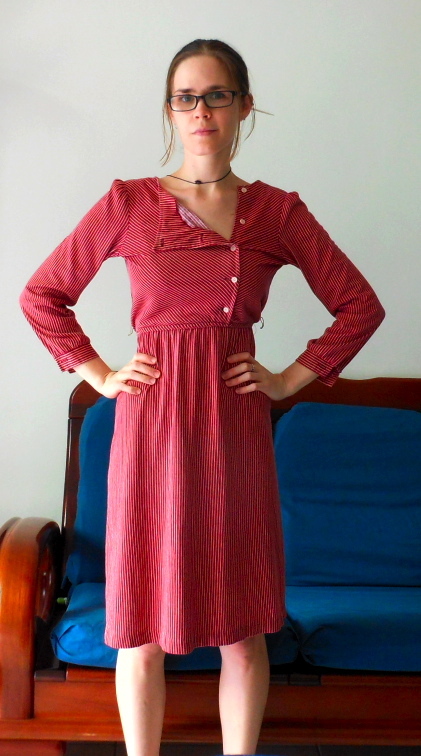 I don’t have a photo of it, but I took the sleeves, cut them into strips, and then sewed the strips into three long strands, which I braided together into a cord. This cord became the strap for my new, summery halter dress. It was 35C(95F) out when I took these pictures and the dress was perfect for the weather. Blue shawl: Aphrodite Shawl. Not a pattern for the fainthearted because it hasn’t been charted yet. As such, the text directions are kind of a nightmare and take some experience with similar patterns to decipher. Made with: Coverette Thread , held double, from a rummage sale. 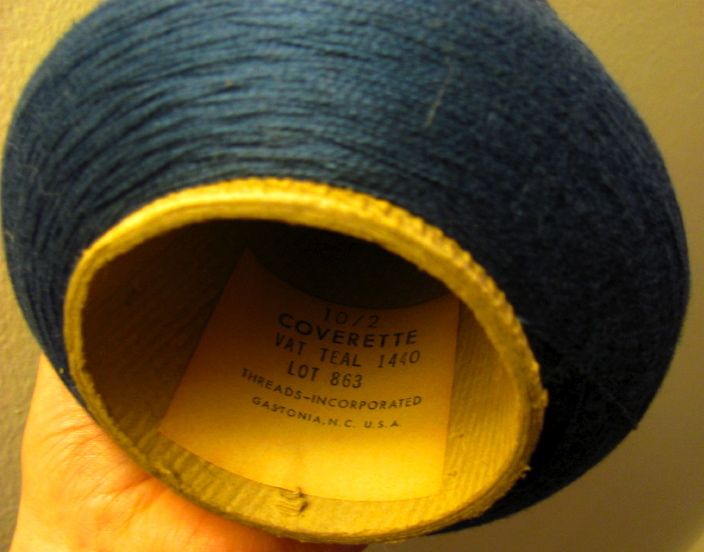 This is the thread I might use for the dress I’m imagining making. I haven’t blocked it yet and it shows, especially down around the edging. I modified the last three rows of the pattern to give me more widely spaced points, but until I block it, they aren’t going to show. I’m a little wary of the bright pink mattress I used for blocking previously. We’ve had some problems with mold in our apartment and I don’t want to wet block the shawl on something absorbent that already smells a little musty. I’ll just leave it unblocked until I have an iron again and a better blocking surface. It’s fine for what it is, something pretty in our living room. The mold is the whole reason why we have the blue cloth room dividers, actually. We used to have decorative sticks from Ikea, but in a scene not unlike one you might see in a (boring) horror film, we discovered them covered in mold in early February. 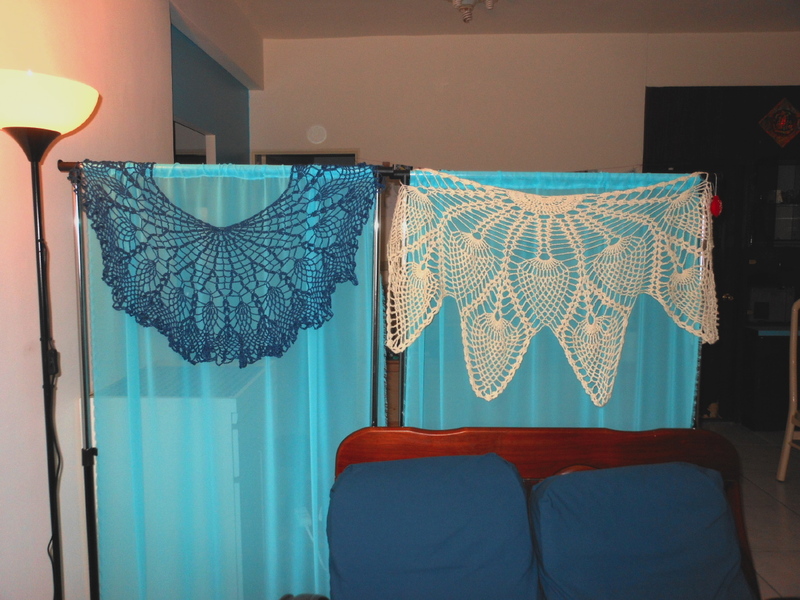 The living room and dining room need some visual separation, so we’ve got clothes drying racks with homemade cheap cloth hangings and now two shawls. Doesn’t look half bad, actually. Made for: me, October 2009, meant as “wings” for a Halloween costume that didn’t work out. Not just the wings, the whole costume. I put far too much time into making something that I felt was like a masquerade ball swan and ended up with everyone thinking I was an angel. Bah. At least I got two years out of the costume.